Rudra Aakriti is one of the residential developments by Rudra Real Estate. The project is located in the city Allahabad. The project offers 2BHK, 3BHK and 4BHK apartments at very competitive and affordable price. It is well planned and is built with all modern amenities. Where is Rudra Aakriti located? The project is located in Naini, Allahabad. What size of flats are available in Rudra Aakriti? The apartment sizes in the project vary from 980.0 sqft to 2000.0 sqft. 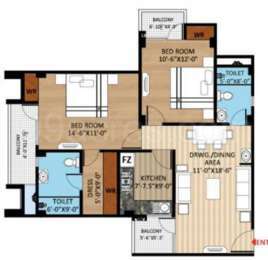 What is the area of 2 bhk in Rudra Aakriti? The size of a 2BHK unit in the project ranges from 980.0 sqft to 1225.0 sqft. 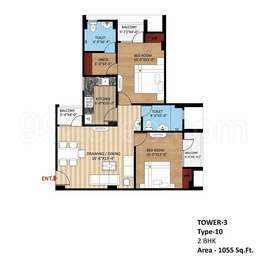 What is size of 3 bhk in Rudra Aakriti? The area of 3 BHK apartments ranges from 1350.0 sqft to 1655.0 sqft. What is size of 4 bhk in Rudra Aakriti? 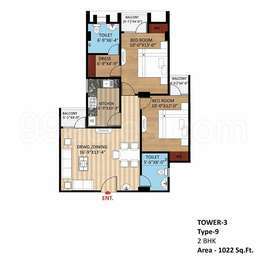 The area of 4 BHK apartments is 2000.0 sqft. What is the 2 bedroom price in Rudra Aakriti? The project offers 2 BHK units for Rs. 3873380. Vitrified tiles in drawing/Living /dining/bedroom . Modular Switches, (Brand Anchor) or Equivalent copper wiring. Sufficient light & power point provision T.V and Phone in living bedroom. Utility Balcony : Power Point for Washing Machine"